Subjects, styles, advertising, other relevant information: The photograph below is reproduced with permission from the excellent site www.peterboroughimages.co.uk, which contains many photographs of Peterborough through the ages. The photo is stated to be from around 1900 and shows premises on the North side of Midgate Peterborough adjacent to Broadway. 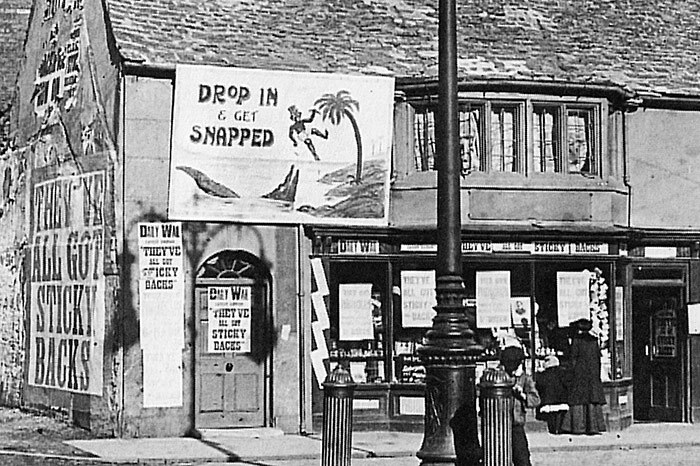 An old shop is plastered with advertising (including one large graphic advertisement which, by today's standards, is outrageously racist) for the wares within - which are "sticky back" photographs. 'Stickyback' is the name by which small gummed-photographs, not much larger than a postage-stamp, are known." [Photo-era Magazine, Vol.28, 1912]. These inexpensive little photographs were a bit like the strips of images obtained today from photo-booths, although stickybacks were produced by hand, not by a machine. Many of the example prints surviving from various sticky-back studios contain an information strip with the name "Sticky Backs", the photographer's address and a negative number. This information has either been from a signboard above or below the subject which has been included within the image, or has been added in the printing process from a second negative. Stickyback photographs were usually produced in strips of four or six identical small images. Depending on how the owner cut up the strip, surviving examples either have the information strip at the top or bottom of the print. Stickyback photographs are one example of a genre of sub carte-de-visite size formats from around the 1890s to 1920s, about which there is more here: www.fadingimages.uk/subgenre.asp . The photographs were very inexpensive, often no more than 3 or 6 pence a dozen, opening up the market to the less well off. Stickyback photographers also generally offered some other, more expensive products, such as small photographs in larger, often embossed, mounts or postcard format prints for those sitters prepared to pay for a larger image. It is not known at this stage who the Stickyback photographer was at this Midgate studio in Peterborough. The date of the photograph may be more recent than was supposed. The building in question protruded across the junction from Midgate, reducing the width of Broadway. In 1899 land East of Broadway from the junction with Midgate was aquired by Peterborough Corporation with the intention of eventually building a new Guildhall there. A property exchange with Mr Fitzwilliam made it possible for the Corporation to realign the junction between Long Causeway and Broadway by pulling down this building. Existing leases on properties affected expired on 25 March 1906 and the Corporation resolved to issue fortnightly leases thereafter until their improvement plan was implemented. Iin September 1906 the Corporation received permission from the Local Government Board to borrow £800 to undertake the works and it is believed that the improvement scheme was implemented soon after. To date however no direct evidence has been found of the exact date of demolition of this building. The same building was occupied in the 1901 census by David Henry Stott and his family. Stott b:1857 Peterborough, was a printer, bookbinder, stationer, bookseller and newsagent and photographs survive of the building with his signage. By the time the 1903 Kelly's Directory of Northampton was published in May 1903 Stott's businesses were operating in Long Causeway and Cross Street. When Kelly's Directory of Northamptonshire 1906 was published, Stott was living at 7 The Crescent, Thorpe Road Peterborough and his business premises were at 3 Westgate and Cross Street. The directory was published in Nov 1906, but both directories must have taken some months to prepare. It seems likely therefore that the photograph below of the Stickyback studio at Midgate was taken some time between 1903 and 1906. Probably the stickyback photographer took a short lease on the premises, making it more likely that he or she was there towards the end of this period. The inventor of the sticky back photo is believed to be Spiridione Grossi and you can read extensive research on this by David Simkin at: http://photohistory-sussex.co.uk/BoultwoodStickyBacksStudio.htm. It is possible that the Peterborough Stickybacks studio in Midgate was a studio in a small chain. There were other Sticky Back and Sticky Back and Postcard studios in many uk towns and cities, including Manchester, Brighton, Sheerness, Portsmouth, Brixton, Woolwich, Dublin - these seem to have been in operation from around 1901. A little later a photographer called Sidney Boultwood set up a number of stickyback studios between 1911 and 1918, in Southend-on-Sea, Lowestoft, Ipswich, Reading, Kidderminster, Halifax, Bath, Derby, Worcester and Southampton. Another Peterborough image has opened up even more questions. The photograph below has been reproduced with the permission of its owner, Carol Petchey, and with the permission of the Chatteris site of the Cambridgeshire Community Archive Network, where it has been posted. The photograph shows Mary Bishop, aged 20, who was born & lived at Beezlings Farm, Chatteris, the daughter of Emily Maltman Bishop (nee Jackson) & Fred Bishop. This appears to be a "Stickybacks" portrait having a text bar at the bottom of the image. The text states "Narrow St PBoro" with a photo number in the left hand corner which appears to be "552". The owner of the image dates this at around 1916. Mary is shown in the 1911 census as being born in 1897, dating the photograph to 1916/17. 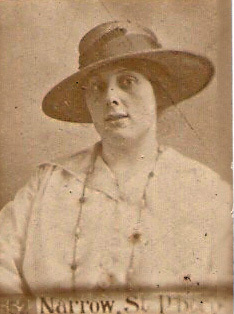 The large hat suggests a date after 1910, so is consistent with this dating. So this suggests there was a stickybacks photographer in Narrow Street Peterborough around 1916, up to some 10 years after the demolition of the Midgate building. Was the Stickyback photograph of Mary Bishop taken by one of the photographers already listed on this site with premises in Narrow Street, or by another, as yet unidentified, photographer? A number of different photographers operated from Narrow Street over the years (Ball and Co at No 13 until 1907 and Squire Phillips at No 16 in 1924). The closest date we have for 1916 is the Rapid Photo Co at 24 Narrow Street in 1914. Was the Narrow St stickyback operator connected with the Midgate one, and if so how? The Rapid Photo Company would appear to have been in the hands of John Borrill Etches when he contracted to dispose of its stock in trade and goodwill to Hunstanton photographer May Bone in April 1916. This was a transaction which Etches had agreed to, but failed to carry out, resulting in May Bone successfully taking him to court in 1921 and winning damages. We have more material on the origins of Stickybacks photographs and the Stickybacks name on our site. http://photohistory-sussex.co.uk/BTNStickyBacks54%20NorthSt.htm has a very detailed account of the Brighton Sticky Back Studio. Examples of Stickyback photos can be found here: http://photohistory-sussex.co.uk/BoultwoodStickyBacksStudio.htm and in the Trott family album here: http://photohistory-sussex.co.uk/StickyBackTrottAlbum.htm. Peterborough Advertiser 8 Feb 1899 p2, 25 October 1899, 15 January 1902, Stamford Mercury 22 January 1904 p6, 3 March 1905, 14 April 1905, 19 May 1905 p4, 7 July 1905 p2, 1 December 1905 p4, 6 June 1906, 7 September 1906. Subjects, styles, advertising, other relevant information: See above entry for STICKYBACKS Midgate Peterborough and accompanyting image. References: Yellow Pages 1990, 1995, 1997, 1998, 2000, http://www.stills-photography.co.uk/index.php BW 20.9.1990. Cambridge Daily News 21 Nov 1986, Cambridge Evening News 19 Jan 1988. Subjects, styles, advertising, other relevant information:The Cambridge Evening News 23 August 1974 reported that Margaret Stocking had an exhibition of her photographs in the coffee bar at the Arts Treatre Cambridge. Margaret had trained at Bournemouth college of Art and had been working as a photographer for the Telegraph and freelance for around 4 years. she had been in Cambridge for about a year, having come from Stratford on Avon. 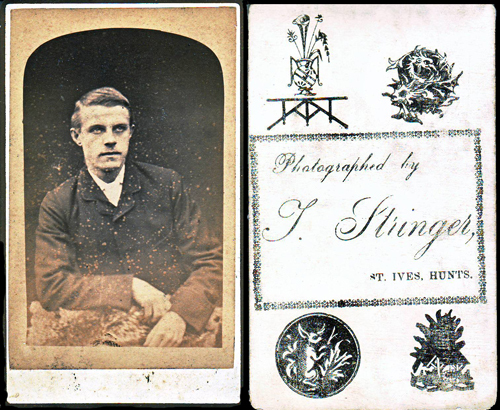 Subjects, styles, advertising, other relevant information: We are grateful for permission to include the carte de visite portrait below of an unknown young man by Stringer from the Huntingdonshire Archives. The reverse of the white mount has a number of hand stamped designs, including the legend: "Photographed by T Stringer St Ives Hunts". No trace of this photographer has yet been found in local trade directories or census returns. References: Huntingdonshire Archives Accession No 4741. Subjects, styles, advertising, other relevant information: – instant passport photos - some sort of franchise arrangement perhaps? References: Peterborough Yellow Pages 1999 block ad for both addresses. Subjects, styles, advertising, other relevant information: Joseph Sturton b:1815 Sleaford Lincs, was a chemist and druggist at 119 Fitzroy Street Cambridge in the 1861 census. He was assisted by his wife Elizabeth b:1824 Cambridge. Their children, all born in Cambridge, were: Anne Ainsworth b:1842, Miriam b:1847, Martha Hooper b:1848, Susanna b:1853, Richard b:1855, Joseph Ashworth b:1857 and Mary Elizabeth b:1858. In 1862 Mr Sturton chemist and druggist of Fitzroy Street Cambridge was mentioned in the Cambridge Independent Press (12/4/1862) in the case of a suicide who had taken a fatal dose of Laudnum purchased from his chemist's shop. In 1871 the family was living at 1 Park Terrace Cambridge. Joseph was a "chemist and landowner", assisted by his wife and daughter Susanna and his son Richard was an apprentice chemist. The family had two servants. By 1881 Joseph had changed his occupation and was described as a farmer. In 1881 Richard Sturton was living at 28 New Square Cambridge, a chemist and oil merchant employing 12 men and 6 boys. He was living with his wife, Mary Emma b:1861 Peterborough. In 1881 Joseph Ashworth Sturton was living at 6 Warkworth Street Cambridge and was an oil merchant. In 1891 Richard, still a chemist, had moved to 6 Park Terrace Cambridge. His children were: David Allan b:1883, Elizabeth b:1884, Joseph b:1885 and Phillip Leslie b:1888. Joseph Sturton was by this time describing himself as a retired chemist and Joseph Ashworth Sturton was living at Trumpington Cambridge and was described as a provision merchant and farmer. In 1895 Richard was nominated as a County Councillor for Cambridgeshire. In 1901 Joseph Ashworth Sturton was living in Hills Road Cambridge and was a grocer. In 1910 Joseph Sturton died. By 1911 Richard was a retired Chemist; he died in 1924. Joseph Ashworth Sturton died in 1929. Described in one local trade directory as "wholesale druggists, pharmaceutical dealers and photographic dealer". Were any of the Sturtons also photographers or did they simply provide photographic chemicals / equipment? In 1902 when a Committee of local photographers was formed to deal with a Photographic Convention visiting Cambridge, one Committee Member was R.Sturton. Subjects, styles, advertising, other relevant information: Arthur was the son of Samuel Suckling b:1819 Steeple Bumpstead, the local chemist and druggist in Linton High Street. In 1881 Arthur, aged 16, was also described as a chemist. In 1891 Arthur was a cabinet maker. He was a carpenter and picture frame maker in 1901 and foreman joiner in 1911. Presumably photography was a secondary occupation. Kellys Directory of Cambridgeshire lists him as a photographer between 1904-16. References: Cambridge Chronicle 10/9/1859. CB Chronicle 14/4/1860 reported five photogrphic artists at that month's Godmanchester Fair. Subjects, styles, advertising, other relevant information: In October 1864 there was a fire at the premises of Mr Swaine, photographer, of Little South Street Wisbech. He was unpacking glass from a crate and the straw packing caught fire - but for prompt assistance the whole house would have caught fire. In 1871 George was listed as a photographer living in Canal Row, Wisbech. In 1881 George was listed in the census as a painter and photographer living at 20 Norfolk St East with his wife Elizabeth, a milliner and bonnet maker, b. Leeds 1832 and their 7 children aged between 21 and 6 years. In 1892 and 1896 he was listed as a photographer and plumber. In 1891 George was living in Norfolk Street East, Wisbech and was a house painter and photographer. In the 1901 Census George was living in Wisbech and described as a painter and photographer. In 1911 he was living in St Peters Road Wisbech and occupation was shown as house painter. Kellys Directory of Cambridgeshire 1883 listed as a photographer 20 Norfolk St East. Kellys Directory of Cambridgeshire, Norfolk and Suffolk, Kelly and Co London Aug 1892 listed as a photographer and plumber. Photographer and plumber, Kellys Directory of Cambridgeshire, Norfolk and Suffolk, Kelly and Co London Sept 1896.